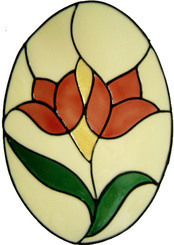 These lovely floral tulip panels look wonderful as traditional stained glass designs in doorways porches and entrance halls. Tulips can be in any colour. Other oval flower designs also available.